Those born in families following the Sanatana Dharma, are in a much higher level of Karmic evolution. People don’t actually choose their religion. They are born into families practising different religions. There are some notorious devilish cults, which bring their children up exposing them to a lot of violence. Such people not only derive pleasure in looting others and in chopping their heads but they do all that believing that they are following God’s commandments! Whereas in the case of those born in the cradle of the Sanatana Dharma, war simply does not exist in their psyche and this is because of DHARMA. In order to be a good human being, you don’t need religion but you need Dharma. In fact in many cases, religion is the root cause of all evil. Organised religions are created with political intentions. Megalomaniac rulers of course need obedient, subservient and brainwashed masses. They certainly don’t want their subjects to be questioning them. Sanatana Dharma is not an organised religion. It was neither started by any single person nor named after any one. It is a way of life that has been there – for a very long time. 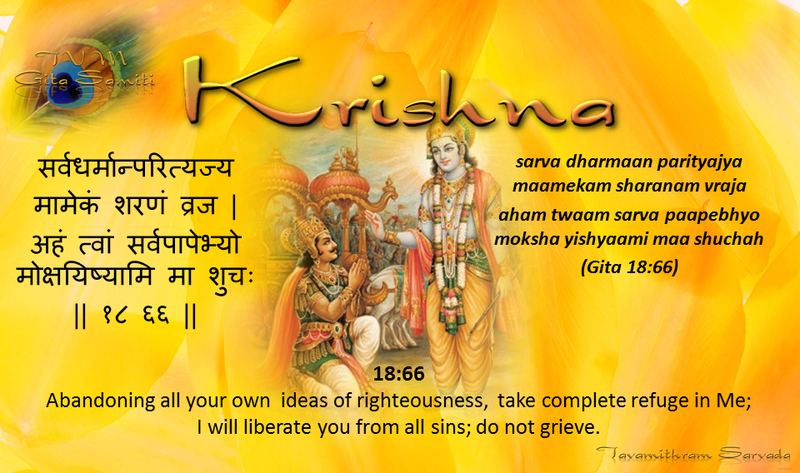 Dharma can be interpreted in numerous ways but the simplest interpretation for the term would be RIGHTEOUSNESS. The one basic natural law that its followers need to follow is that no one has the right to damage nature or to harm other beings that exist in it. 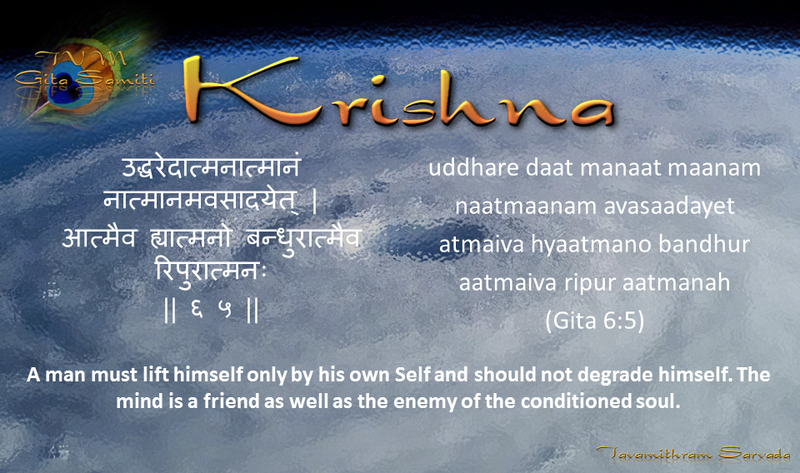 The Sanatana Dharma is based on the law of Karma – Cause and Effect or Action and Reaction. Krishna teaches us that the soul and body are completely different. The body is merely a vehicle given to a soul in order to travel through a Janma or lifetime. The soul never rests! When it has completed its Karmic evolution, it attains ‘Moksha’ which means release from the cycle of birth and death and becoming one with the Supreme Consciousness. Everyone is actually on a guided course. The course is plotted based on the Karmic points each soul possesses. Changes in the course are caused by the positive and negative Karmic points earned by a soul during a particular Janma. 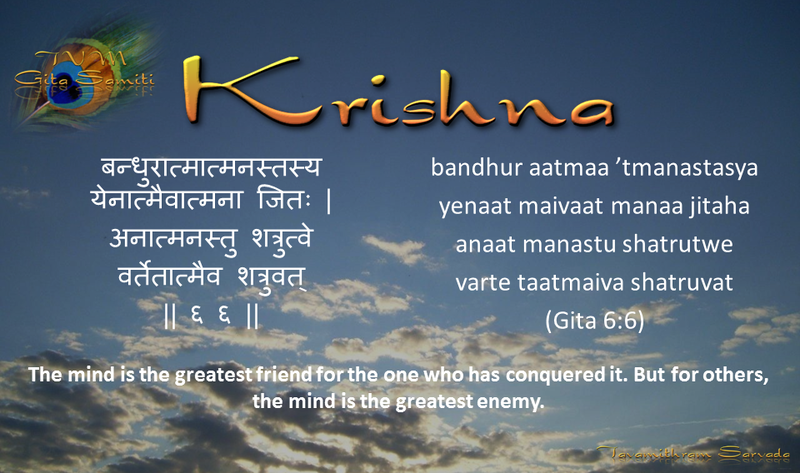 The Bhagavad Gita is the most amazing metaphor that can be applied to anyone’s life. Every situation that a person may face in life has been thought of and well explained in it. 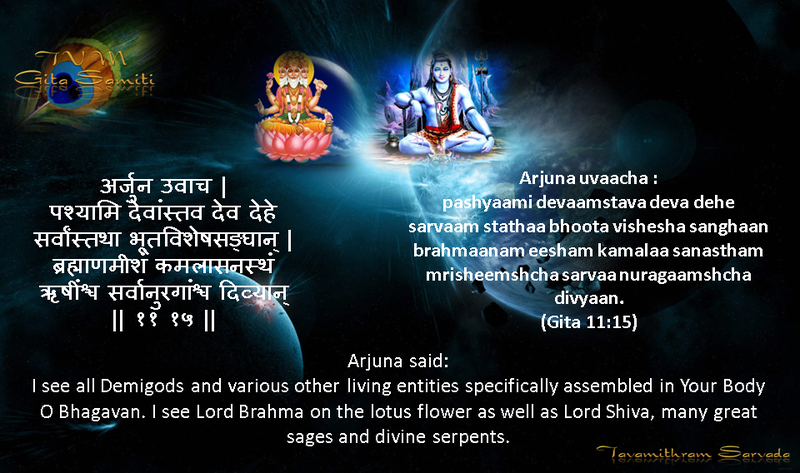 Brief explanation of the three Margas prescribed by Bhagavan Shri Krishna. 1. Bhakti Marga : The path of devotion. 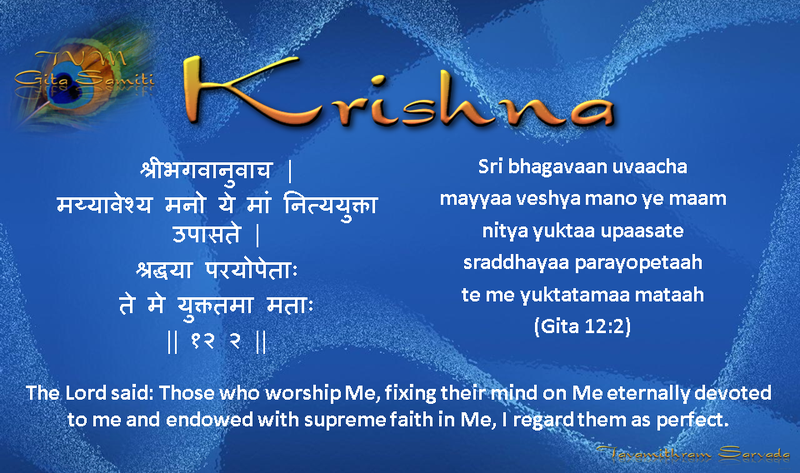 A devotee following this path has ABSOLUTE faith in Krishna. 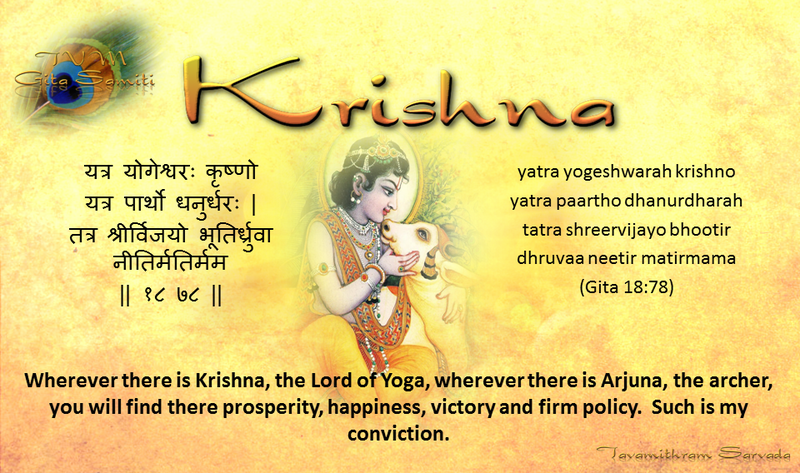 He or she has pure love for Krishna. This is the path of love, compassion, kindness and service to God through love for Krishna and for all beings. A person following this Marga or path performs poojas, recites verses from the Gita, sings songs and ‘Kirtans’ in praise of Krishna and chants Mantras. He or she visualises Krishna in a certain form and meditates on Him, showers love on His image or Vigraha. The devotee has absolute faith in Him and follows each and every teaching of His. Such a person is at peace with himself and does not cause harm to others. When the mind of a person is so engrossed in Bhakti, no negative thoughts will enter into such a mind. It is always love and peace. 2. Gnyana Marga: Path of Supreme Knowledge. This is the path of wisdom and knowledge. One who follows this path is constantly introspecting, contemplating and exploring the true meaning of life and existence. 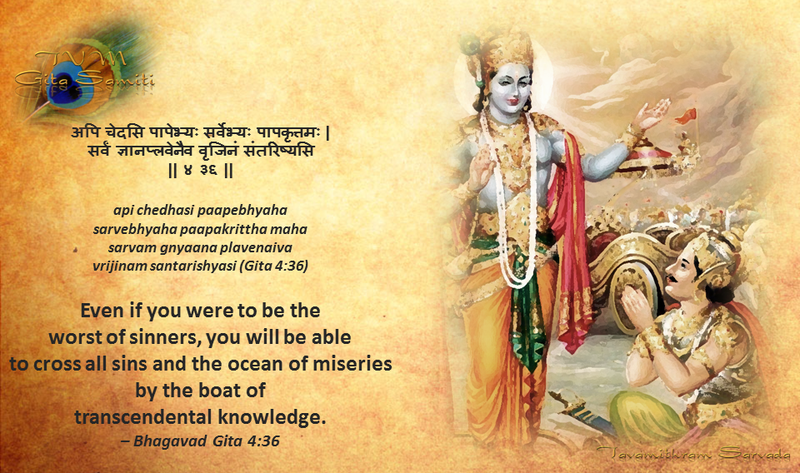 A person who follows this path understands the entire Gita as a metaphor. 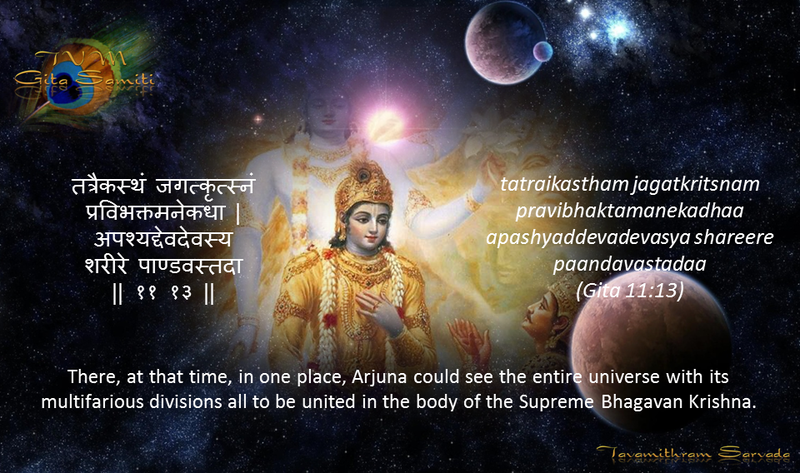 He or she sees Krishna as the personification of the entire Universe and follows natural laws including that of Karma. Such a person sees Krishna in everything and everything in Krishna. The Sanatana Dharma does not propound the theory that God is separate and that He is sitting in some imaginary heaven watching everyone. True knowledge is deeply sensing the fact that we are all part of the Supreme System. This is the highest level of philosophy. 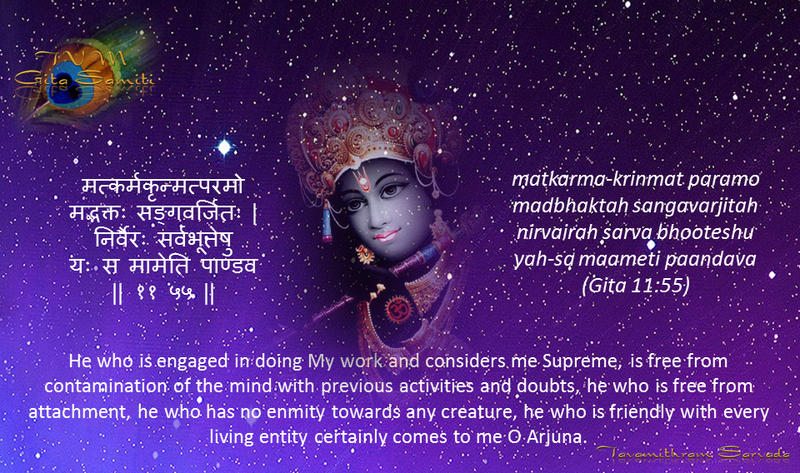 Krishna is the formless One Who can take any form. 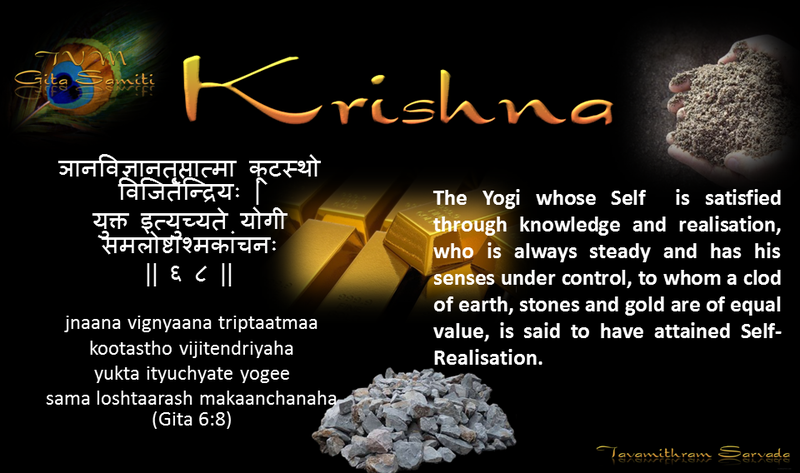 The devotee can visualise Krishna in any form in order to be able to focus his mind on and meditate on Krishna. The Gita makes you aware of the truth that everything stems from the mind and therefore training the mind with the right knowledge, decides not only the life of a person but also the entire process of his or her Karmic evolution. The will to do something or to not do something originates in the mind. Every action begins with a thought. The first step followed by all other steps in a journey of ten thousand miles, begins in the mind. Everything is in the mind. There are many people who say that they do not believe in Krishna, God, religion or in the metaphorical epics explaining the Sanatana Dharma. That is perfectly alright. The Sanatana Dharma does not menace you with an eternal hellfire or anything like that like some devilish foreign cults do. 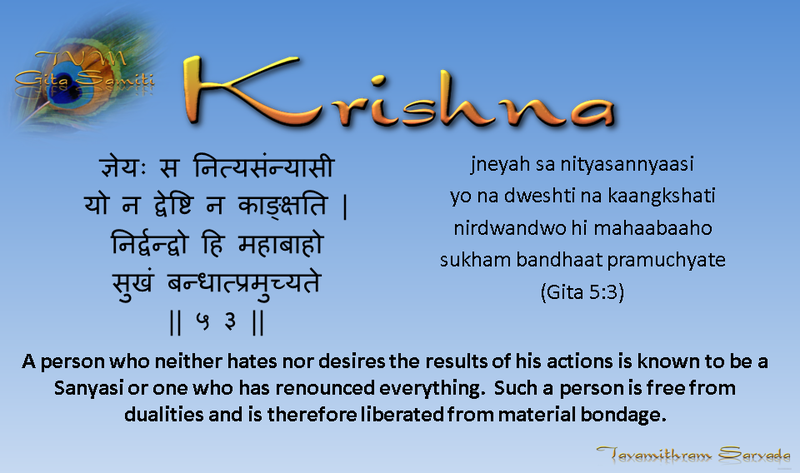 There is no compulsion to believe in the existence of Krishna. A person who performs his or her duty without any attachment to the fruit of their action is a Karmayogi and such a person is automatically dear to Krishna! This person has only one goal and that is perfection in work. There are a few countries in the world with ‘Karma Yoga’ ingrained in the national psyche. Such countries turn out the best products with highest levels of quality. Their people don’t ‘work less’ for less money but maintain the quality of their work under all circumstances. All that Karmayogis need to do is to perform their work to the best of their ability and not be attached to the results.